This simple app packs a lot of punch. It’s not social, so it’s strictly to help you decide what you want to wear – without the opinions and (sometimes) criticism of your friends. It’s a simple concept. You take photos of each item of clothing in your rotation, as well as accessories, and you build outfits for each day. This also helps you keep track of what you’ve worn so you can mix and match with style. Available for iProducts. 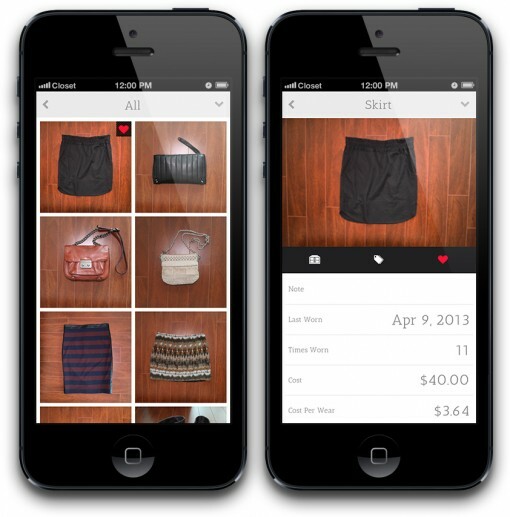 This app combines your closet with your wish list and your friends. When you’re window-shopping online, you can upload photos of items you want to add to your wardrobe, share your “closet” with friends, and even sell items you no longer need. As an added bonus, there’s a trip-planner on the website that helps you make sure you have all the clothes you need for your travels. Ah, a fashion app designed with selfies in mind. This app lets you post photos of your cutest outfits, create tags based on the type of outfit, your personal style, colors, fabrics, and even the occasion. Then you can connect with friends, find other peoples’ outfits you like and use them for inspiration. We all organize in our own way, and for those who like to be color-coded, this is the app for you. Once you input your clothes, you can sort them by color, pattern, or brand. You can keep track of what you’ve worn in the calendar part of the app. Stylitics even gives you updates on style and fashion news, the weather, and fashion history tidbits. This app combines the simplistic design of the Closet app with the weather alerts of Stylitics and the sorting and tagging abilities in Pose. It’s a well-rounded app for beginning fashion bloggers and photographers. Sort outfits into categories such as The Office, Evening Fancy, and so forth. You can browse your own closet or look for ideas. Whether you’re a career person or a stay-at-home parent, technology finds ways to make you look good at any time of the day. Don’t let your busy lifestyle hinder you from becoming fashionable. With a touch of a fingertip, you can find some great suggestions on what to wear and when to wear them. Next time you have dinner with a special someone, make sure you consult your apps for the best outfit.